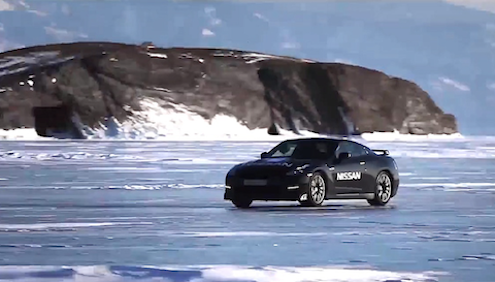 The hot 540 hp 2014 Nissan GT-R gets cold in Russia to break the speed record for a production car on natural ice. While you wouldn’t normally think of taking a 540 horsepower sports car and setting a speed record while driving on ice, that’s exactly what Nissan did earlier this month. On April 5, 2013 in a joint project of Nissan in Russia, and LAV Productions company, the GT-R set a new Russian speed record on ice. Why would Nissan take their new 2014 GT-R all the way to the Russian region of Siberia to set a new speed record? Two Russians, Audrey Leontjev official pilot for the Russian G-Drive racing team, and famous auto journalist Roman Rusinov, took the new Nissan sports car to Bakai Lake in Russia to go fast, and also to show how well the ATTESA E-TS all wheel drive system works on the 2014 GT-R. The natural lake in the south of the Russian region of Siberia is crescent shaped and one of the longest lakes on the planet and the perfect place to give it a test. It has a surface area of 31,722 km (12,248 square miles) and the lake is incredibly deep at 1,642 meters (5,387 ft.). And at this time of year it is cold and frozen. The Russian team along with Nissan, went to the frozen Siberian lake and took the new Nissan GT-R with a 3.8-liter V6 engine pumping out 540 horsepower and mated with a six-speed automatic GR6 transmission. They chose Baikal Lake in Russia as the testing grounds because it is long enough to run at super high speeds and then they have to get the super sports car stooped. The temperature is a frigid -22 degrees C ( -7.6 F) and the ice is 1.4 meters thick. Before the car launches down the frozen lake, journalist Roman Rusinov says, “As for today these speed drives are symbolic for us. We want to associate with Russian history, Russian character. Baikai is a true symbol of Russia.” Leontjev gets ready for the record-setting run and puts on his gloves and racing helmet. He straps himself into the Nissan sports car and gets ready for the record run. The GT-R launches from a start as the tires try to grip the frozen surface of the lake. The speed climbs as the car continues down the frozen track for the 7 km (4.35 mile) run. In the video below, Leontjev struggles to keep the car under control on the frozen lake as the car wants to drift sideways. He says, “Every moment you drive you should adjust the steering wheel, the slightest gust of wind makes the car loose the track; all seven kilometers of the route you are fighting against the power of nature. The car speeds to a record top speed of 294.8 km/h (183 mph). This is a Russian speed record for a production car on ice. What this writer wants to know is how many kilometers it took to get the GT-R to a stop on the frozen lake? The Nissan team was trying to set a Russian speed record on ice with the 2014 Nissan GT-R and the performance Brembo brakes were most likely never touched at those speeds. While most GT-R owners will never drive at those speeds on ice, its still quite a feat for the Nissan sports car. Watch the record-breaking Nissan GT-R as it goes big, and gets cold in Russia video below.